Real ones this time! We had the honor and pleasure of hosting two visitors recently, Dr. Gerard Fitzgerald and Dr. Gabriella Petrick. Both are both history professors. Gerard is teaching a course this year on the history of technology at UVa. He is actually going to make his students read Herman Haupt's book on military bridging. Gabriella specializes in the history of food at NYU. Here Gabriella and I are discussing the optimum height for a valance. We concluded that there is no such thing because people come in different heights. Gerard remarked that his students at the first class were dismayed to learn that the history they were going to learn will start before the invention of the internet. To put things in perspective, the students in college today have no memory of Ronald Reagan and Mikhail Gorbachev as political leaders. Steam power? Industrial revolution? That's ancient history, buddy where's the nearest WiFi? Since I had several reject sections of the lattice truss left over from the bridge project, I gave them to Gerard to use in his class. I also donated the prototype HO model of Crozet tunnel to the cause. Hopefully it will help his students better understand the evolution of technology. Gerard is a HO modeler building a layout of a freelanced branch of the C&O near Richmond. He is associate editor of the Seaboard-Coast Line Modeler at http://s-clmodeler.aclsal.org/index.htm He has written for the LDSIG Journal and lectured at numerous NMRA shows. They have a home in Delaware, where the layout resides. 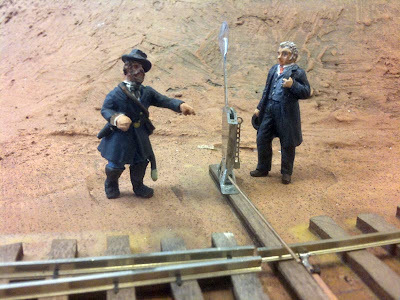 One of the problems I am encountering in this project relates to the "O" scale civil war era figures. 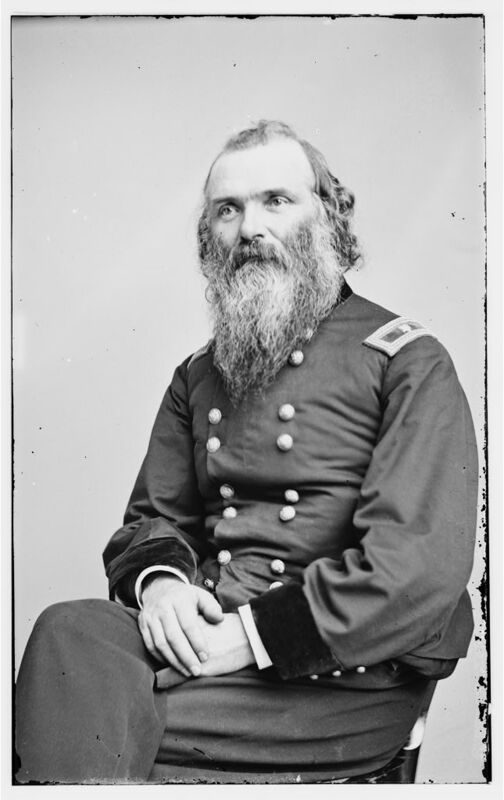 While there is a pretty good selection of 40mm civil war era figures available, such as from the Sash and Saber, and the Honorable Lead and Boiler Suit (HLBS) company, they are intended for wargaming. Thus they are built robustly to take abuse from handling during games. Hence the overscale swords, and other weapons. They also tend to have "war-like" poses, charging, shooting etc. I expect that I will be converting many of them for use on the more sedate operation of running the railroad. For example, I'll probably have to grind off the swords, weapons and adjust the poses. I'll also have to remove the cast on bases and introduce pins so they can be installed on the layout. I find that I am ordering artillery men, and officers more for use on the layout. Most of the infantry figures have weapons and battle rattle (canteens, packs, mussette bags, cartridges boxes etc.) inappropriate for figures that would be hanging around the RR. However, I do plan to use some of them for at least one scene where a long line of troops are marching off to their camp. There are a few manufactures that make civilians appropriate for this era and I have a bunch on order, mostly from the UK. 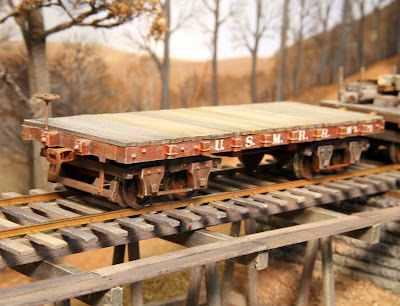 Woodland scenics makes a line of O figures that are good, especially their railroad crew. But, they will need to be converted to 1860's attire. The Sash and Saber figures have separate heads, so swaping heads with the Woodland Scenics figures will be easy. (They are shown at the lower right of the photo). Since I am modeling winter, adding frock coats will not be hard. The Woodland Scenics figures need to be repainted, as their existing paint jobs are too cartoonish. Another problem I encountered is that what constitutes an O scale figure varies from manufacturer to manufacturer. Compare the figures in the prototype photo of the locomotive Haupt to the model figures. For reference, the locomotive has 60 inch drivers. The 28mm wargame figures are in general too small, but will work in background scenes, especially the Old Glory figures. Most 28mm figures are notorious for being over-scale to allow the sculptor more room to model detail. However, the over-scale size helps in my application. They are also more affordable, especially the mounted troops. The Tamiya 1:48th scale figure tends to be a good 25 percent smaller than the Woodland Scenics guys. The Woodland Scenics are about the same size as the Sash and Sabre. I purchased some 1:43 figures from the UK and these are slightly smaller than the Woodland Scenics, which should go the other way if one believe the nominal scale. Dave Emery painted the 1/43rd Stadden figure. As can be expected, the Tamiya figures are probably closest to scale. This Tamiya figure is a German soldier from their WWII line. They do not currently offer a ACW era figure. Being styrene, it should be easy to modify. The trick is to mix and match the figures while remaining aware of the size differences. I enjoy figure modeling, so this will just add more play/build value to the layout. Mr. D. Emery, a noted New England RR executive, visited the USMRR A&F today. Here Mr. Emery is discussing installation of a new switch stand with General Haupt. 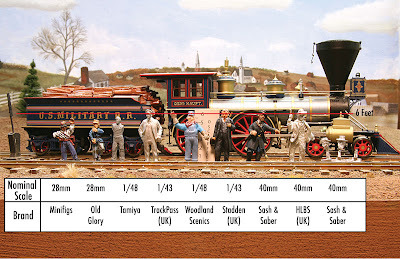 Mr. Emery is a British 1/48th scale figure based on Mr. George Stevenson, the developer of the first practical steam locomotive, the Rocket. He was painted by Dave Emery and given to me as a Christmas present. He used a combination of acrylic and oils. It is well done. Thanks Dave. In the meantime, work continues on the roadbed. My brother Marco took a crack at it, but was having trouble getting the spline to flow evenly without kinks. I was able to get some nice flowing splines using my 30 inch radius track template. The trick is to let the splines take their natural curve. He was trying to force easements and was having trouble with cracking and kinks. Note the holes in the wall to allow the track to arc through the closet before returning to main room. The track will be hidden under a hill side as it traverses toward the harbor in the workshop. The fascia here needs to be replaced as it needs to be higher at the back to allow for a sloped hill. The hill will help hide the view of Falmouth when standing in the aisle near Brooke, hopefully making the layout seem larger. The plywood table is a remnant of an earlier N Scale layout. 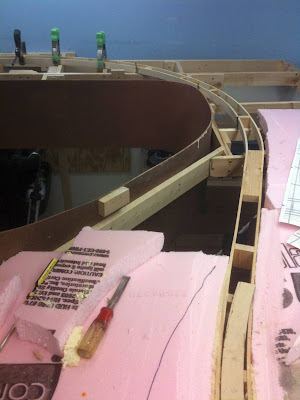 The radius of the inside curve is too tight for the O Scale track plan so I will need to pull it out. The bottom photo shows the roadbed on the north side of Potomac Creek. 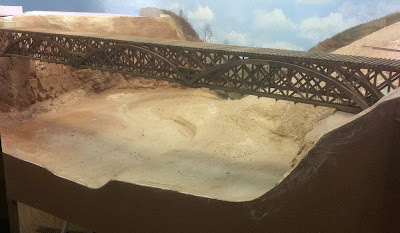 The bridge is not yet done, so I won't be able to lay the track here until it is. USMRR Aquia & Fredericksburg Line. 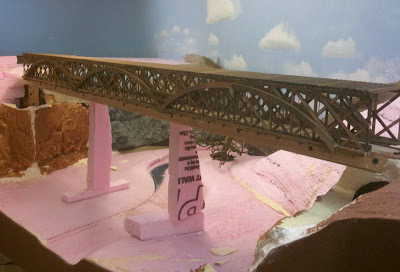 The Potomac Creek bridge is almost done, so it was time to prepare the scenery under the bridge. Once the bridge is installed I won't be able to reach very far behind the bridge. First I cut the 1x2 temporary bridge piece. Then I cut away some of the rock outcroppings to make room for the bridge abutments. The selective compression is affecting the natrual look of the abutments, but i think it will end up OK. I installed the rubber rocks mold to the base scenery using hot glue. 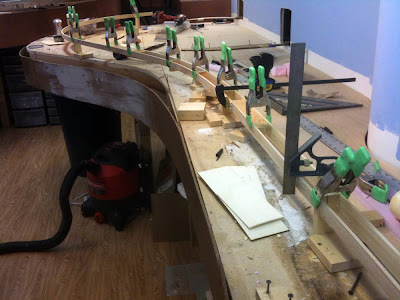 I cut it into sections to better fit the curved slope. 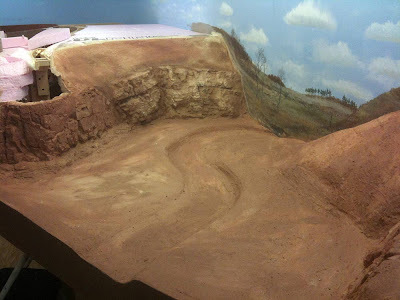 Then I used a mixture of Durhams Water Putty, sifted dirt, acrylic paint and water to make a clay colored scenery base. I applied it with a spatula and paint brush to blend in the rock carvings and stream bed. Next I need to touch up the paint on the backdrop, especially where the creek meets the backdrop. Then the rocks must get final paint and dry brushing, ground cover, stream bed detailing, etc. Here is the nearly finished bridge place temporarily in position. The stringers and ties will bring the rail height to the proper level. Then I will adjust the abutments underneath. This is reverse on how an actual bridge is built, but should work out here. SMR Trains announced some new models this week. Get your orders in before they are all gone. Got to love that paint job on the McCallum's tender. This locomotive was named after General McCallum, the general manager of the USMRR. A confederate version for the Richmond and Danville will also be available. 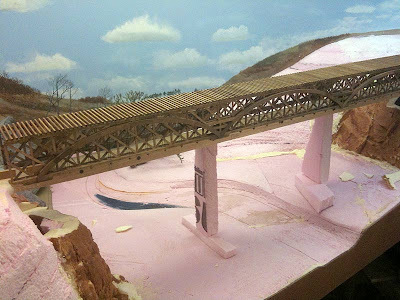 The holidays have slowed progress on the layout, but I have been able to get some work done on the Potomac Creek Bridge. 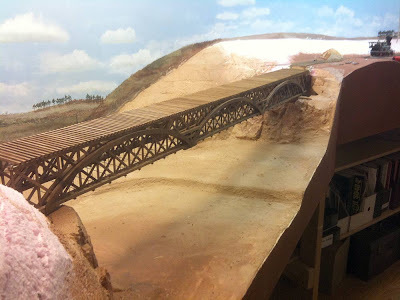 Here the bridge is resting on the 1x2 lumber temporary roadbed. Once the bridge is ready, that road bed piece will be taken out and the bridge will drop down to take its place. Note the holes cut in the embankments for the abutments. There are a lot of parts in this thing. It's over 1,000 so far and it's not done. The bridge still needs the upper story supports from arch to upper chord, rail stringers, ties, the lateral Howe Truss along the bottom and NBW's. Then the piers and abutments must be made. Whew, this is becoming the bridge that ate Sheboygan! I spent the weekend working on a new design for wooden rigid beam trucks for my freight cars. The first wooden truck I developed just didn't look right to me. 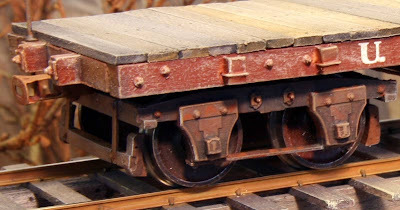 They were a tad chunky using 1/8th inch wood and the design actually caused the freight cars to ride too high. The photo at the left shows the new design on the left and the old design on the right. The new design is based on a NY&H RR truck. 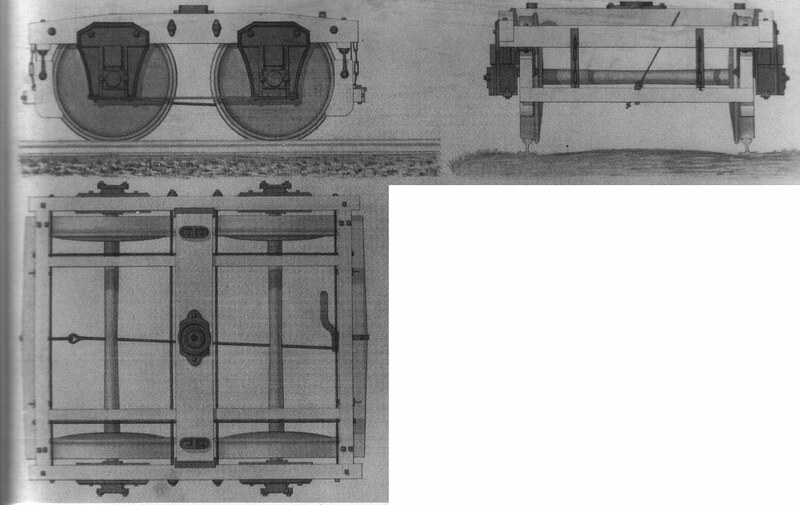 The wheelbase is the same, but the parts are made using 3/32nd basswood. By omitting the delrin bearings, I was able to make the truck narrower. It is difficult to model these cars to prototype dimensions because a standard gauge O scale wheel set has gauge that is .062 inches too wide, and has wheel tread and flange height that are bigger than scale. Once you modify one dimesion to accommodate the over scale wheels, the dimensions of the rest of the truck design must be adjusted to maintain clearance. It took seven iterations of design, laser cut, build and test before I settled on the final design. I also modified the journals. The new design does not use a delrin bearing. The metal axle point rides in an appropriate hole in the journal. With a touch of Wahl Clipper oil, the wheels roll very freely. So just like real railroad trucks, these journals need to be oiled. I made the journals on one side of the truck as separate pieces, so the truck is easier to assemble. Now you first assemble the frame, then install the axles without having to force the axle into the frame. I did not add working brakes to this car. I am thinking about etching parts for the brakes. Each truck has 32 NBWs! This new flat car is also sporting the new photo etched link and pin couplers. They are a fold-up design using etched stainless steel. They are quite sturdy and will show shiny metal when the facing surfaces wear. I also tried making white lettering decals on my laser. They actually worked out. They look great as there is no clear film associated with each letter.